England will host France at Twickenham on Sunday in the second round of the 2019 Six Nations. England is coming after a surprising, brilliant win in Ireland last week. The Three Lions had a bit of a down year in 2018 for their standards, and even if they showed improvement during the November tests a few months ago, they were still widely expected to lose in Dublin against a great Irish team. However, England came out strong right from the start, outpowered Ireland, and was in control for basically the whole game for a marvelous 32-20 win. Now, the English can really be confident of reclaiming the Six Nations title, but if they are to do so they can not afford to lose against France. There were, as usual, a lot of question marks about France coming into this tournament. They showed some glimpses of quality over the last couple of years, but overall there hasn`t really been palpable progress, and 2018 was a rather disappointing year. 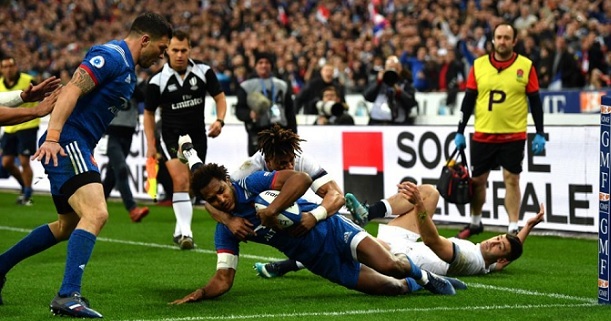 France entered last week`s home opener against Wales with a rather untested lineup, and indeed the performance was an embodiment of French Rugby – a real Jekyll and Hyde performance, with France leading 16-0 at half time only to implode and lose the second half 3-24, for a 19-24 end result! Bet on England v France and claim a 100% (120 Eur) welcome bonus at LSbet now! England has lost Maro Itoje this week, but has no other new injuries, and gets back Launchbury and Moon. France will make 6 changes to the lineup which lost against Wales (three of them by choice, three due to injuries). England looks highly likely to win this, and you would maybe even expect a big win based on what we saw last week. However, France has always been a very difficult opponent for England. England won by more than 10 points against France only once in the last 12 H2H meetings, and hasn`t done it in the last 5, despite being the heavy favorite most of the time. As such, the 13.5 point handicap set by the bookies does seem a bit scary if you are thinking of taking the Three Lions. And it`s even scarier to trust this volatile France team to cover it after their implosion against Wales. Recent matches between the two sides have always been tight and physical, and there`s no reason to expect different this time around. England`s forwards were exceptional against Ireland, and France will field extra power in the starting lineup into this game, so it should be a real physical one. Weather will not be the best. Winds of around 25 km/h are expected at game time. There`s only a 20% chance of rain during the match, but it will rain before and it will be humid, so conditions are expected to be wet. This weather should make it harder to see a lot of points. The wind will obviously affect goal kicking, while the humid conditions will not favor a fluid game of rugby – instead favoring potential knock ons and handling errors, which will often translate into long scrums between two formidable packs. Taking into account the matchup, the lineups, the recent results and the weather, this looks like it could be a real slugfest, and a rather low scoring game. The line is set at 44,5 points, which doesn`t seem high, but it has been surpassed only twice in the last five meetings (one time by only half a point). In the last two years, the results were 19-16 and 22-16. My tip here will be under 44,5 points to be scored. Prediction: England – France 26 – 11.